IPT North American 8-Ball Open . July 30, 2006 . Las Vegas, Nev. 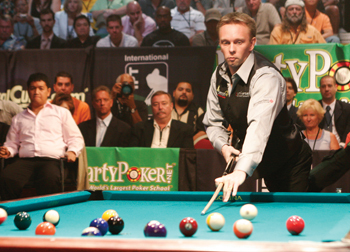 In the case game of what was then the richest final in the history of pool, Thorsten Hohmann gently positioned the cue ball on the headstring for his break. Down in his stance, the steely German eyed a rack that was worth $350,000. With a $2 million purse, the International Pool Tour's North American 8-Ball Open brought together 200 of the world's greatest shooters, with Hohmann and Marlon Manalo left to decide who'd take home the $350,000 top prize. Surviving six grueling rounds of group play over nine days, Hohmann repeatedly escaped apparently lethal situations to advance. In the last two rounds alone, he needed to win his final matches to survive, including an 8-1 trouncing of Manalo to secure a seat in the final. But that score was a bit misleading, since the robust Filipino had already advanced to the final with wins over Efren Reyes, Dennis Orcollo, Ralf Souquet and Evgeny Stalev. For the final, the pair entered the arena in the Venetian Las Vegas more like prize fighters than pool players. The two went eye-to-eye for a choreographed staredown, with a few fans chuckling at the mild-mannered pair's attempt at intimidation. En route to the lucrative race-to-8, Manalo had better overall winning percentages in total games and matches, but Hohmann won both head-to-head match-ups. With both men exhibiting nearly flawless shotmaking and position play, the final appeared to be a breaking contest. "I have to make a ball on the break, then I have to get a good layout, and the same for him," Hohmann said before the match. "He can run five racks in a row, and I can run five racks." Early on, the match went according to script. If one buried a ball on the break, he ran out. If he broke dry, the other cleaned up. Trailing 3-2, Manalo was the first to err, jawing a combination in the unforgiving IPT pockets. Hohmann cleared an elementary layout for an easy $350,000. Hohmann took the gift for a two-rack lead, but ran into his own problems. Leading 4-2, he rattled a ball in the foot rail's left corner. Up 5-4, he missed another shot in the same pocket. Tied at 6 games apiece, Hohmann watched the cue ball skip into the side pocket on the break. He realized that scratch could've cost him big. "Of course, I thought, 'I don't want to end the game with a scratch on the break,'" Hohmann said. "But those feelings, they come and go, or I make them go away." The mental toughness needed to brave a 200-player field would be tested again. After Manalo cleaned up to get on the hill, he failed to pocket anything on the break. Hohmann ran the open table, forcing a case game. Visibly tense, the usually absolute-zero cool Hohmann detonated the rack. The 9 dropped in the side, and the cue ball stopped on the headspot. "Oh, my God, this is the easiest runout I've had in the tournament!" Hohmann thought to himself. Five solids congregated in the middle of the table, leaving an elementary runout for the 27-year-old former world champion. Five stop shots and two easy position plays later, Hohmann didn't flinch as he buried the title-clinching 8 in the corner.